Water is an essential yet boring drink. I can never meet up with drinking the recommended daily quantity of water. Flavoured water to the rescue! Great for weightloss especially the cucumber and lemon detox water which contains pectin. Pectin is a type of carbohydrate that helps keep you fuller for longer. Improves your complexion. Your skin looks healthier and glows when you are well hydrated. It helps remove the toxins in our body thereby making you look younger. Flavoured water helps you drink more water and when you drink more water, cleansing occurs. If you are pregnant, please consult your doctor before taking any of these detox water. You can buy mint and parsley from supermarkets all over the world. If you are in Nigeria, ask those who sell salad ingredients for mint leaves. Mint leaves smell like peppermint. 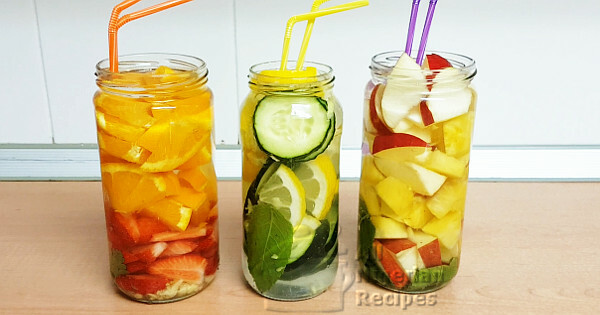 Making detox water is easy, just chop up the ingredients and put in their respective glass containers, add water and put in the fridge overnight to give the ingredients time to infuse into the water. I do not chop the leaves. Watch the video below for details. Drink all through the next day. I make enough to last me a whole day, usually 2 litres worth. Make a new batch each day. This means that at the end of the day, throw away the ingredients, make a new one and keep in your fridge and drink all through the next day.